Concept Description: In my D&D game last week, we had a moment that called for a 'shock and awe' moment. It was my job to run in with my Goliath Warden and set up that "Shock and Awe" moment. I kept wishing I had a weapon that would have helped with that task. Help me out please. 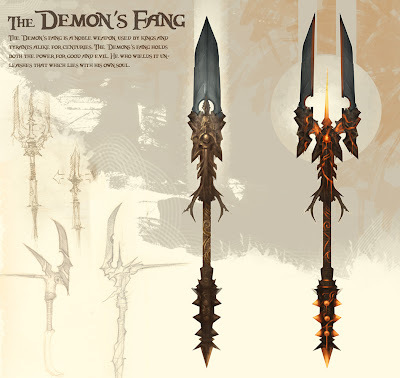 Design a weapon that just screams death and destruction, or makes monsters pause before going up against someone wielding it. The only constraints, it has to be a fantasy based martial implement (swords, hammers, axes, etc.) and has to be wieldable by a 8 foot tall, 300 pound juggernaught of destruction. See what the D&D Goliath looks like here. I haven't designed a prop in a long while and I have to admit that this was a bit challenge. But i ended up having a blast: the research alone was worth it. This is absolutely gorgeous! I'm a little behind, but I posted this to my blog anyway (http://thenerdpatrol.net) - it deserved featuring!